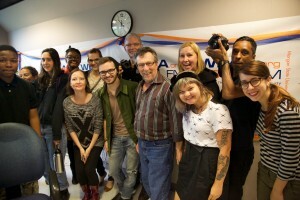 During the spring 2014 semester, students from four UMBC classes teamed up to produce Stories of Deindustrialized Baltimore, a five-part radio series aired on the Marc Steiner Show on WEAA 88.9 FM from Monday, May 12th through Friday, May 16th. The series traces the boom and bust of the industrial communities of Baybrook and the Sparrows Point Steel Mill. The stories and memories of community members are threaded together to explore the industrial history and deindustrialized present of each area, how various industries shaped the lives of countless residents and former workers, including their stories of struggle and hardship, and how a sustainable future for these areas can be forged. Teaming up with the Center for Emerging Media, the series was produced as part of the larger Post-industrial Places Project (PIPP), which seeks to examine the processes and impacts of deindustrialization in the greater Baltimore region, led by UMBC Professors Steve Bradley (Visual Arts), Bill Shewbridge (Media and Communication Studies), Nicole King (American Studies), and Michelle Stefano (American Studies and Maryland Traditions, the folklife program of the Maryland State Arts Council). The project was supported by funding from the BreakingGround initiative at UMBC. Also, listen to a in-studio roundtable discussion with students and community members from Friday, March 16th’s Marc Steiner Show.